WHEN WE ALL FALL ASLEEP, WHERE DO WE GO? is the debut studio album by Billie Eilish, released by Darkroom/Interscope Records on March 29, 2019. I have not been able to stop listening. Eilish is one true song stylist as she takes her fans and listeners on a musical journey with her. Eilish is really doing something quite fresh here. When We Fall Asleep, Where Do We Go?, is burning up the charts – and with good reason. An album that has deservedly captured the attention of everyone. It’s exhilarating when pop stars throw caution to the wind like this. The whole album is a beautifully comprehensive piece of music. Pitched somewhere between Lorde and Lana Del Rey, it mines a dark, spare sound that emphasizes Eilish’s dead-eyed attitude and sophisticated wit, bringing together folk, EDM and hip-hop influences. Her young age does not prevent Billie Eilish from coming out with a strong debut. With such a strong starting piece, she could well be the inspiration that the likes of Taylor Swift, Lady Gaga, and Katy Perry will use to try to stay relevant. A highly anticipated and eclectic album, without a doubt, but it is not without its growing pains. Billie Eilish, pop's new teen whiz. If you want a playlist to cover every possible mood people will experience during a party, you’re on to a winner. When We Fall Asleep, Where Do We Go? keeps listeners guessing. This album cements her as a force to be reckoned with. The result is a brilliantly diverse mix of electro-pop, trap, R'n'B and folk. A beautiful disaster that combines contradictions with clichés. The album is impressive from start to finish, with few missteps in-between. This album sticks out for its bare-bones operation between Eilish and her brother. Eilish does not have to adapt to fit trends; she is the trend. Billie Eilish has cemented herself as a bonafide pop star. As much as Eilish seems to be on top of the world at this point, this is a sight that’s been seen countless times before. When We All Fall Asleep, Where Do We Go? reveals she's a savvy character-crafter. It is a pleasure to listen to from start to finish. Eilish has created something impressively unique and meaningful. The results sound ghostly but glossy. By the end of 2019 this album will not be forgotten. Maybe Gens Z and X will learn to coexist after all. Just don’t ask Y.
I’m a big Billie Eilish fan now and am looking forward to her next album. The album is nothing revelatory, but it’s fun. After such a flawlessly creative release, it’s hard to imagine Billie ever doing wrong. A very powerful mature new sound. Eilish's​ genre-bending pop is a culmination of Gen Z's joyless exploration of the world, and signals a welcome end to the cookie-cutter teenage pop star. A level of emotionalism that artists well into their 40s and 50s struggle to attain. For her fans, When We All Fall Asleep is yet another iteration of her fluid approach to genre, and intensely personal lyricism. Eilish capitalizes on her immense hype, proving that she more than deserves to stick around for years to come. This is a stunning debut, and we’re almost certain to hear more great things from Billie Eilish soon. Eilish’s debut makes a strong case that it won’t be long until we see her in a crown. An artful, well-crafted, and unique pop album. 14 tracks of moody, genre-defying brilliance. Eilish leaves us desperate for more with the bold statement of an artist who is only just starting to find her voice. It's the deeper sincerity and complexity that makes WWFAWDWG truly special. When We All Fall Asleep, Where Do We Go? is moody and ominous. It exists on a lunar-outpost of its own creation. Overall this album heavily impresses with a dark and moody twist on growing up in this current state of the world. The end result is an impeccable debut album. The balance of strange and simple usually works. The album creates a reality for the listener to exist within, right at Billie’s side. Eilish has a distinct sound, with tracks which cover things that would scare away other artists. It’s rare to hear someone so young have this much fun on their debut record while still crafting something that’s downright game-changing in its bravado. It’s an anxious, chilling collection of tracks that are simultaneously supernatural and undeniably human. Every new listen of the album uncovers a new layer in the labyrinthian production. When We Fall Asleep immediately stands out as one of the best debut records of the decade. A remarkable compilation from someone so young. A beauty in minimalistic pop with a lo-fi edge. The production on the new songs has a slightly sinister, intentionally dark, and somewhat provocative tone that makes it a must-listen in 2019. Sleekly produced but uncomfortably cursory in its explorations of loneliness and depression. She’s undoubtedly and apologetically doing something that is uniquely hers. Despite the hints of old timers (you can also hear strains of Bowie and White Album Beatles here, too), this is a groundbreaking record. You’re not going to find anything here especially original, unless you’re not yet old enough to relate to Melodrama and too young to remember Pure Heroine. 'WHEN WE ALL FALL ASLEEP, WHERE DO WE GO?' is a musical masterpiece. This debut feels strangely profound and infinitely danceable. Each new look into Billie's world has offered something achingly authentic and uniquely her own, and that experience is maximized as an album. When We Fall Asleep, Where Do We Go is a volatile launching pad. Eilish is a star who’ll keep burning as long as she does not burn out. I hope she can enjoy the fact that these songs will send her stratospheric. We have not the faintest idea where we end up when we fall asleep, but Billie Eilish's songs accompany us, numb more than dreamy, in a state of liberating drowsiness. Billie Eilish offers moments of macabre brilliance on her uneven debut album. Forget the hype and listen carefully to her debut with the far too long title and you will hear a fledgling artist looking for her voice. It’s unexpectedly fantastic, actually. The kids are right about her. A marvellously expansive record with plenty to show off the teenager's extraordinary eye for diverse songwriting. When We Fall Asleep… is often remarkable. While Eilish’s first album is far from perfect, it’s uniquely her own — thought-provoking, messy, brilliant in parts and shambolic in other. ‘When We All Fall Asleep, Where Do We Go?’ is a supremely exciting, innovative first move from a pop voice that feels utterly fresh and modern. With her debut album, she’s even tougher: tough enough to show some heart. A debut record that showcases a bold artistic vision and a willingness to move beyond the boundaries of pop conventions. Asleep is frequently stunning and doubly so for a debut album by someone not even old enough to vote. Never has a teen pop star so gone dark. She demonstrates that she can do it all, hinting at a bright future that could truly go in any direction, as messy and hopeful as youth can get. A haunted house of pop dreams. When We All Fall Asleep, Where Do We Go? falls short of the dream scene we were hoping for. 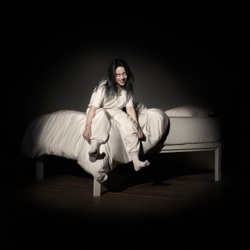 When We All Fall Asleep, its artistic achievements aside, manages to exist somewhere between critique, honest reflection of the zeitgeist and a progression of the Billie Eilish mystery. There’s something about Eilish that suggests she has more to offer than this. Eilish is continuing to create a sound that defies category but dominates the charts with her debut album. It’s likely to cement her growing reputation as a 21st century music business unicorn who embodies all the creative and commercial promise of online youth culture. Just when you’re starting to get comfortable, she throws out a surprise curveball to check you’re still paying attention. Billie Eilish’s dystopian hip-hop and balladry shows us what it’s like to be young now. On this debut, Billie Eilish delivers an exceptional body of work. ‘When We All Fall Asleep, Where Do We Go?’ is a brave and fortuitous debut album from the LA teen, capturing the hopes, fears and vulnerabilities of an entire generation. She links the Lana Del Rey dreaminess of her early songs with the savvy, hip-hop inspired artist that she has become. Her debut album, When We All Fall Asleep, Where Do We Go?, confirms what most teenagers already know: Eilish is something special, a pop avatar of a Generation Z mood of sensitive disaffection. Eilish has concocted one of the last great pop statements of the decade. Dark, jittering party anthems punctured by sardonic ballads, all determined to shock. A memorable and game-changing debut album. When We All Fall Asleep, Where Do We Go?” feels like a rock ‘n’ roll album, even if there’s virtually nothing on it that sounds like rock music. Eilish uses intimacy to amplify scares. Different and great! All though Billie Eilish’s new song “Bury A Friend” isn’t heavily focused on the vocals, as most people are complaining about, the beat and the lyrics gives an eerie vibe to the song and makes the song very different from what you hear nowadays. Da Best This is hands down the best new artist that is releasing music constantly!!! You keep going Billie and be the star that you are!!! If only you could rate things more than 5 stars. She totally qualifies for that!! YES So glad she’s finally getting the recognition she deserves and can’t wait for the new album! So far the songs from the new album have been bomb af. Her music in general is just hauntingly beautiful! Love her. Dark Angel Voice I love her the tone of her voice...I often forget I’m listening to such sad, emotionally deep songs bc her voice is so majestic.